The Republic of Gamers range from Asus reminds us just a little bit of Diego Maradonna. It started out young and sprightly, doing things no other boards could do. Before long however, the pressure and the success became too much and the boards became bloated, embarrassingly expensive and unfocused. Fortunately the Rampage II Gene proved to be a renaissance for the RoG brand, with its excellent performance and overclocking potential in a tight, tidy micro-ATX format and price. As a result, we've been waiting with baited breath for the follow up, and after months of pestering, we finally got our hands on the Asus Rampage III Gene (R3G). 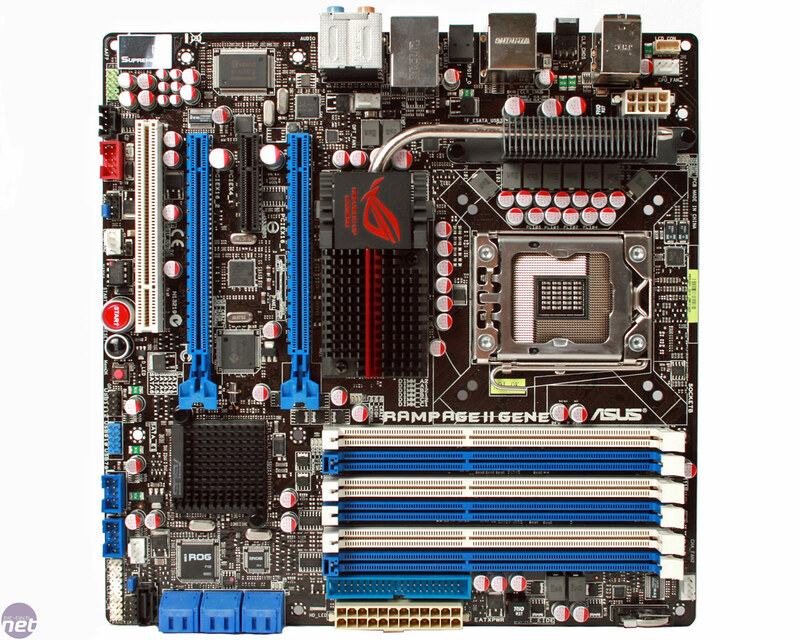 It's built around the same X58 chipset and LGA1366 as the previous Rampage Gene board, so we hoped it'd prove to be as desirable. As with its predecessor, the R3G comes in a fairly diminutive box with a functional if slightly limited bundle of goodies. Included are eight SATA cables, a USB extension cable, the RoG Q-Shield and an SLI bridge. Also thrown in are some cable ties, Asus' useful Q-Connectors (for wiring up the front panel) and some RoG sticker sheets. Interestingly, two of the SATA cables are marked as specifically for use with the SATA 6Gbps ports, but we're dubious as to whether these are anything but a gimmick. So what's different with the new R3G then? The first and most noticeable difference is the colour scheme. The Rampage II Gene wasn't an unattractive board, but its white, black, red and blue colours did look a little schizophrenic. 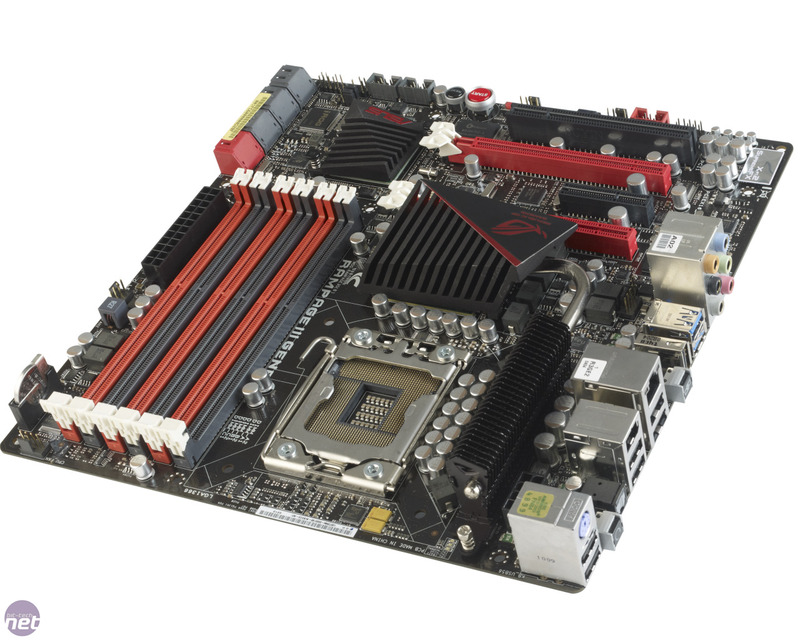 Asus has bought the R3G in line with other RoG boards, and its dressed in red and black throughout. The heatpipe-linked heatsinks that cover the VRMs and chipset look particularly good, and their matt black finish and angular styling gives an impression of quietly understated aggression. They are clamped down firmly too, which gives the board an instant feel of quality - we can't tell you how many boards we've tested that have had heatsinks that rock in their mounts when prodded. The other headline specification changes are the addition of two USB 3 and two SATA 6Gbps ports. These additions are slowly becoming standard on all new boards, despite the fact we've not seen many peripherals or SSDs that can actually take advantage of the new connections. We are seeing a number of USB 3-ready cases come through our labs at the moment, so we'd like to see a USB 3 header to allow these front panel ports to be wired up without an untidy pass-through cable. 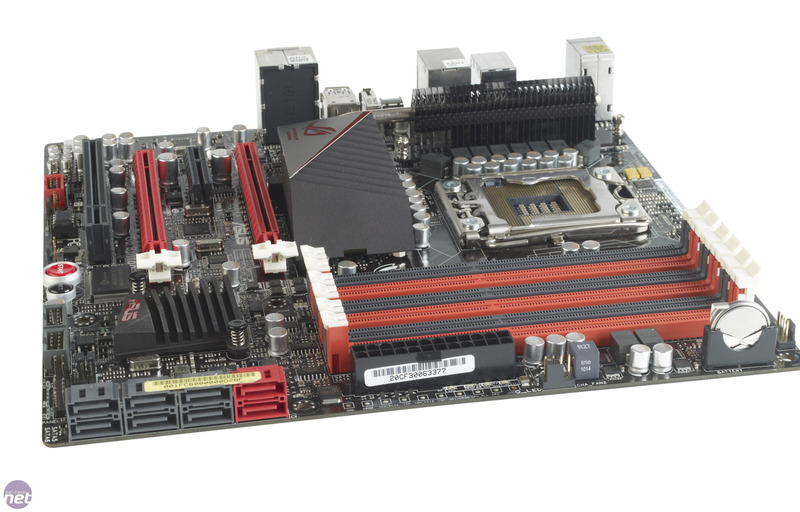 There are reports of boards with USB 3 headers coming soon. The on-board sound of the board has seen an upgrade too, with the new SupremeFX X-Fi 2 audio built in. This offers EAX 5.0 support and the X-Fi Crystallizer, and comes with THX-certified 8-channel HD audio connections. The new codec is unlikely to dramatically change the way you music or games sound, but is an improvement over standard Intel HD audio nonetheless. Overclocking Base Clock 100-500MHz. Max voltages: CPU 2.5V, CPU PLL 2.05V, QPI/VTT 2.5V RAM 2.5V. Ports 6 x SATA 3Gbps, 2 x SATA 6Gbps, 1 x PS/2, 10 x USB 2, 2 x USB 3, 2 x FireWire, 4 x surround audio out, line in, mic, LAN, optical S/PDIF out.